For other uses, see Silent Spring (disambiguation). 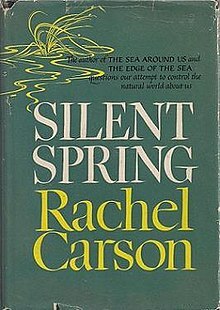 Silent Spring is an environmental science book by Rachel Carson. The book was published on September 27, 1962, documenting the adverse environmental effects caused by the indiscriminate use of pesticides. Carson accused the chemical industry of spreading disinformation, and public officials of accepting the industry's marketing claims unquestioningly. Fire Ants on Trial - public service film produced by the USDA. It was translated to Swedish and published in 1963, titled Tyst vår. Carson compounded the problem by combining her overconfidence with another then-prevalent ecological error, the belief that natural systems tend to evolve into a balanced state, a community of interconnected species that persists in perpetual equilibrium unless disturbed by humans....In this view, ecosystems have a place and function for every creature and every species in them, and all work together as a kind of "superorganism." When people wipe out species, they are, in effect, destroying the vital organs of this superorganism. They are heedlessly upsetting the balance of nature, which could bring down the whole ecosystem—a spiritual as well as ecological catastrophe. Unfortunately, nature is not, in fact, in balance. Instead ecosystems are temporary, chaotic assemblages of species, with relations between them and their environment in constant flux. ^ a b c McLaughlin, Dorothy. "Fooling with Nature: Silent Spring Revisited". Frontline. PBS. Archived from the original on March 10, 2010. Retrieved August 24, 2010. ^ "DDT". United States Environmental Protection Agency. Archived from the original on October 22, 2007. Retrieved November 4, 2007. 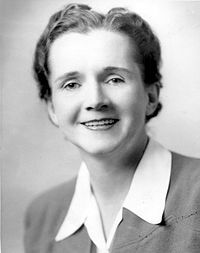 ^ a b c d e Paull, John (2013) "The Rachel Carson Letters and the Making of Silent Spring" Archived 2013-11-03 at the Wayback Machine, Sage Open, 3 (July):1–12. ^ Josie Glausiusz. (2007), "Better Planet: Can A Maligned Pesticide Save Lives?" Discover Magazine. p. 34. ^ a b Peakall, David B.; Van Emden, Helmut Fritz, eds. (1996). Beyond silent spring: integrated pest management and chemical safety. London: Chapman & Hall. ISBN 978-0-412-72810-5. ^ a b Richards H (September 1999). "Beyond Silent Spring: Integrated Pest Management and Chemical Safety. Edited by H.F. van Emden and D.B. Peakall". Integrated Pest Management Reviews. 4 (3): 269–270. doi: 10.1023/A:1009686508200. ^ a b "25 Greatest Science Books of All Time". Discover Magazine. December 2006. Archived from the original on 2009-01-29. Retrieved 2008-10-08. ^ Greene, Jennifer (February 2008). "Obituary for Marjorie Spock" (PDF). Newsletter of the Portland Branch of Anthroposophical Society in Portland, Oregon. 4 (2): 7. Archived from the original (PDF) on 29 August 2015. Retrieved 29 August 2015. ^ Matthiessen, Peter (2007). Courage for the Earth: Writers, Scientists, and Activists Celebrate the Life and Writing of Rachel Carson. Mariner Books. p. 135. ISBN 978-0-618-87276-3. ^ a b Himaras, Eleni (May 26, 2007). "Rachel's Legacy – Rachel Carson's groundbreaking 'Silent Spring'". The Patriot Ledger. Quincy, MA. ^ Wishart, Adam (2007). One in Three: A Son's Journey Into the History and Science of Cancer. New York, NY: Grove Press. p. 82. ISBN 978-0-8021-1840-0. ^ Hynes, H. Patricia (September 10, 1992). "PERSPECTIVE ON THE ENVIRONMENT Unfinished Business: 'Silent Spring' On the 30th anniversary of Rachel Carson's indictment of DDT, pesticides still threaten human life". Los Angeles Times. p. 7 (Metro Section). ^ Coates, Peter A. (October 2005). "The Strange Stillness of the Past: Toward an Environmental History of Sound and Noise". Environmental History. 10 (4): 636–665. doi: 10.1093/envhis/10.4.636. Archived from the original on 29 September 2017. Retrieved 12 June 2017. ^ Lear 1997, pp. 407–08. Quotation (p. 408) from a June 13, 1962 letter from Carson to Dorothy Freeman. ^ Lear 1997, pp. 429–30 Benson's supposed comments were widely repeated at the time, but have not been directly confirmed. ^ Lear 1997, pp. 437–49; quotation from 449. ^ "2003 National Women's History Month Honorees: Rachel Carson". Archived from the original on 2005-12-08. Retrieved 2014-03-13. CS1 maint: BOT: original-url status unknown ( link). Retrieved September 23, 2007. ^ 1963: Bertelsmann Verlagsgruppe, with an afterword written by Theo Löbsack. 2nd ed. in 1964: Biederstein Verlag ; 3rd ed. 1965: Büchergilde Gutenberg. 1968: first paperback edition (dtv). ^ Карсон, Рахиль (1965). Безмолвная весна : пер. с англ [Silent Spring] (in Russian). Москва: Прогресс. ^ George M. Woodwell, Broken Eggshells, Science 84, November. ^ Gary Kroll, "Rachel Carson-Silent Spring Archived 2007-07-15 at the Wayback Machine: A Brief History of Ecology as a Subversive Subject". Onlineethics.org: National Academy of Engineering. Retrieved November 4, 2007. ^ EPA Alumni Association: EPA Administrator William Ruckelshaus and some of his closest aides recall the DDT ban decision, Video Archived 2016-10-11 at the Wayback Machine, Transcript Archived 2016-10-11 at the Wayback Machine (see pages 13, 14). ^ Baum, Rudy M. (June 4, 2007). "Rachel Carson". Chemical and Engineering News. 85 (23): 5. (a) Rich Karlgaard, " But Her Heart Was Good Archived 2017-09-29 at the Wayback Machine", Forbes.com, May 18, 2007. Accessed September 23, 2007. (c) Paul Driessen, " Forty Years of Perverse 'Responsibility,'", The Washington Times, April 29, 2007. Accessed May 30, 2007. (d) Iain Murray, " Silent Alarmism: A Centennial We Could Do Without Archived 2007-11-21 at the Wayback Machine", National Review, May 31, 2007. Accessed May 31, 2007. ^ Weir, Kirsten (June 29, 2007). "Rachel Carson's birthday bashing". Salon.com. Archived from the original on April 15, 2008. Retrieved July 1, 2007. ^ Sarvana, Adam (May 28, 2009). "Bate and Switch: How a free-market magician manipulated two decades of environmental science". Natural Resources New Service. Archived from the original on May 24, 2010. Retrieved June 2, 2009. ^ Gutstein, Donald (November 24, 2009). Not a Conspiracy Theory: How Business Propaganda Hijacks Democracy. Key Porter Books. ISBN 978-1-55470-191-9. . Relevant excerpt at Gutstein, Donald (January 22, 2010). "Inside the DDT Propaganda Machine". The Tyee. Archived from the original on January 25, 2010. Retrieved January 22, 2010. ^ a b c John Quiggin; Tim Lambert (24 May 2008). "Rehabilitating Carson". Prospect (146). Archived from the original on 12 May 2012. Retrieved 17 March 2014. ^ Souder, William (September 4, 2012). "Rachel Carson Didn't Kill Millions of Africans". Slate. Archived from the original on April 22, 2014. Retrieved March 30, 2014. ^ Dunn R (2012). "In retrospect: Silent Spring". Nature. 485 (7400): 578–79. Bibcode: 2012Natur.485..578D. doi: 10.1038/485578a. Archived from the original on 2017-04-26. Retrieved 2014-03-17. ^ "Malaria Prevention and Control". East African Community Health. Archived from the original on 2015-01-08. ^ Malaria Foundation International Archived 2010-11-18 at WebCite. Retrieved March 15, 2006. ^ "The 100 Best Non-Fiction Books of the Century" Archived 2016-01-27 at the Wayback Machine. National Review. Retrieved January 19, 2016. ^ "National Historic Chemical Landmarks - American Chemical Society". American Chemical Society. Archived from the original on 2008-09-07. Retrieved 2016-08-24. ^ Druckenbrod, Andrew (February 18, 2012). "PSO takes hard look at turmoil, both environmental and human". Pittsburgh Post-Gazette. Archived from the original on May 18, 2015. Retrieved May 11, 2015. ^ Kanny, Mark (February 18, 2012). "Offerings of 'Silent Spring,' venerated material excel". Pittsburgh Tribune-Review. Archived from the original on May 18, 2015. Retrieved May 11, 2015. ^ Kozinn, Allan (February 27, 2012). "Capping Off Prokofiev With 'New York, New York'". The New York Times. Archived from the original on May 19, 2015. Retrieved May 11, 2015. ^ Thomsen, Simon (2014-01-09). "Sir David Attenborough Did A Reddit Q&A: Worst Thing He's Seen? Chimps Killing Monkeys". Business Insider Australia. Archived from the original on 2016-03-06. Retrieved 2016-03-01. Carson, Rachel (1962). Silent Spring. Houghton Mifflin Company. Graham, Frank (1970) [1st. Pub. Houghton Mifflin, 1970]. Since Silent Spring. Fawcett. ISBN 978-0-449-23141-8. Hynes, H. Patricia (1989). The Recurring Silent Spring. Athene series. New York: Pergamon Press. ISBN 978-0-08-037117-7. Lytle, Mark Hamilton (2007). The Gentle Subversive: Rachel Carson, Silent Spring, and the Rise of the Environmental Movement. New York: Oxford University Press. ISBN 978-0-19-517246-1. Murphy, Priscilla Coit (2005). What A Book Can Do: The Publication and Reception of Silent Spring. University of Massachusetts Press. ISBN 978-1-55849-476-3. Litmans, Brian; Miller, Jeff (2004). Silent Spring Revisited: Pesticide Use And Endangered Species. Diane Publishing Co. ISBN 978-0-7567-4439-7. Oreskes, Naomi; Conway, Erik M. (2010). Merchants of Doubt. New York: Bloomsbury. ISBN 978-1-59691-610-4.